I think most hockey fans, and sports fans in general, are aware of the surprising success of the Las Vegas Golden Knights, in their first year in the National Hockey League. For an expansion team to finish as high as they did, and to then contend in the Stanley Cup final seems like a remarkable feat. Indeed, some fans find it so remarkable as to be incredible, and therefore suspect. To recap, Las Vegas finished their 2017-18 expansion season with 109 points, winning their division. This put them in 5th place overall, in a 31 team league, of which 16 teams make the playoffs. They then won the quarter finals, semi-finals, and conference finals. These are feats unprecedented in professional hockey history for an expansion team, and rarely equaled in other professional sports. The draft rules were actually quite generous to Las Vegas. The presence of superstars is not as definitive for success as is commonly believed. Management is not as at evaluating talent and predicting player performance as commonly believed. As the Bible says, time and chance happeneth to them all. The model, described below, is relatively simple, but by varying model parameters, it can come up with scenarios that show Las Vegas’s final standings to be unexpectedly good, but not impossibly so. The draft rules allowed each team to protect 7 forwards, 3 defense men and 1 goalie. Alternatively, they could protect 8 skaters and a goalie. My model assumes that teams will use the first alternative, when protecting their preferred players. Furthermore, Las Vegas was to choose one player from each team. 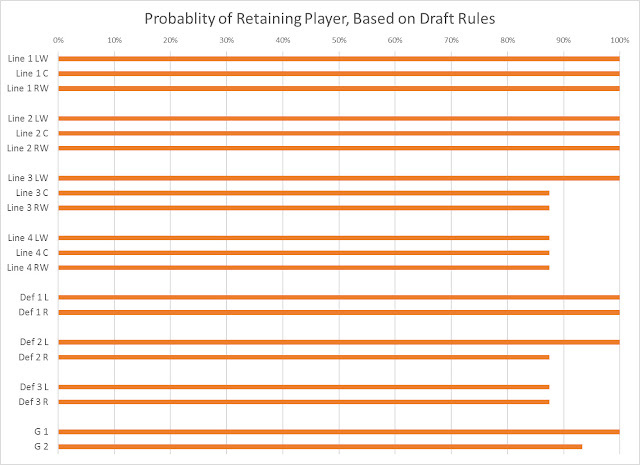 The probability of keeping unprotected players was included in the model, with the constraint that there would be a total expectation of each team losing one player’s hockey value. For simplicity, I made the probability of any one of the unprotected players being drafted the same (17%), except for the second goalie (7%). That way, Las Vegas will draft its allotment of one skater from each team, and 2 goalies overall. My model focused on the usual lineup dressed for games – 4 forward lines, 3 defense pairings, and 2 goalies. I simulated 30 teams, each protecting the players on their top lines. I use a concept I call “hockey value” to measure the gains that Las Vegas makes in the draft, and the corresponding losses to the other teams. Again, this is meant to be a general concept of what value a particular position contributes to a team. The highest valued position is given 100 points, with other positions receiving correspondingly lower point values. The total hockey value of a team's players is then summed, and the results are ranked to determine the overall competitiveness of the team. Note that the non-Las Vegas teams are not identified, nor strictly speaking is Las Vegas. The model is a general one, seeking to understand the likely outcomes of a simulated set of drafts, such as the one that actually produced the Las Vegas Golden Knights, under the rules for that draft. Note that this use of the term “hockey value” is not related to the financial value of the various franchises, or the teams’ payrolls. Instead, it is a relative measure of hockey playing ability and the importance of the various positions on a hypothetical hockey team. By varying the underlying hockey value parameters, one can test different assumptions and see which ones give a reasonable probability of a Las Vegas type expansion draft team to end up high in the standings. 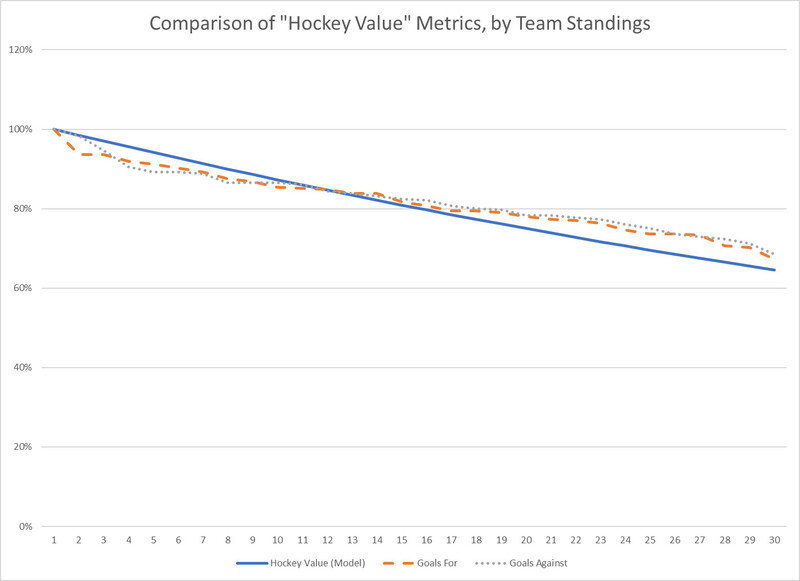 To reflect the fact that teams that finish higher in the standings must have more hockey value than those lower down, the total hockey value of each team was diminished by 2.5%, for each rank lower in the standings. That gave the hockey value of the 30th team at about 65% of the leading team’s value. That conforms quite well with the difference between first and last in goals for (67%), goals against (69%), and average player salary (64%), all metrics that common sense tells us should be reasonable proxies for each team’s “hockey value”. The accompanying graph shows how those metrics compare. The hockey value of a given team is calculated by multiplying the value of each position by the overall value of the team (given by its position in the standings), minus the value lost in the draft to Las Vegas. 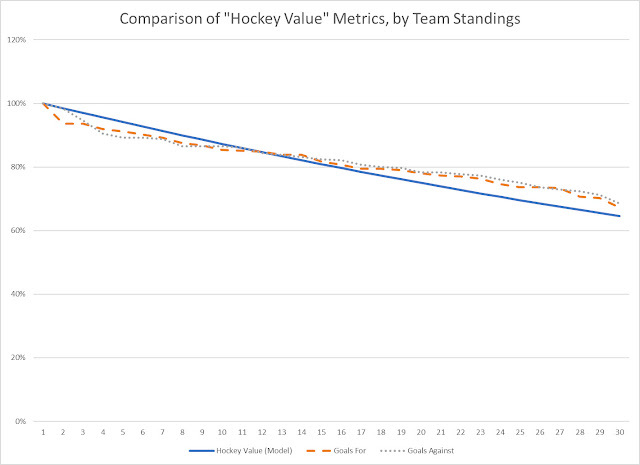 Those values are then multiplied by the team's overall relative hockey value, as determined by its position in the standings. Las Vegas’s total hockey value is given by adding up the hockey value of the players that it gains in the draft (one per team). Las Vegas’s position in this hockey value scale can then be computed, and used as a proxy for how well it would do in reality, should actual hockey correspond fairly well to the assumptions of the models being tested. Given these results, we can see which model results in some reasonable prospect for a team put together under these draft rules to have an expansion year as highly placed as Las Vegas actually did. A moderate model (1), where there is differentiation between the lines and defense pairings, in terms of hockey value, but it is not extreme. It represents a moderate view of how a hockey team actually works – for example, the first line players are more important than their second line counterparts, but a top ranked team will probably have a second line that is also very good. Similarly for the defense pairings. A second moderate model (2), which is intermediate between the moderate model 1 and the egalitarian model. It places a bit more importance on the second line and below than the first model does. An extremely egalitarian model (3), where each player on the 20 man roster is actually as important as the rest. This model is highly unlikely to represent reality, but is there as a “logical extreme” test. An extreme superstar model (4), where the top line’s value was much higher than the second line’s value, which was in turn much higher than the third line, and so on. This model probably represents the average person’s view of how hockey teams work – in other words, very superstar driven. Here is a typical result of a run, using Model 2 and a 10% randomization factor (explained below). The results for Las Vegas are at the bottom of this model run result, and indicate that it would have a predicted #5 finish in the standings. Model 1 – the expansion team is predicted to come in 10th. Model 2 – the expansion team is predicted to come in 6th. Model 3 – the expansion team is predicted to come in 2nd. Model 4 – the expansion team is predicted to come in 24th . It seems clear that Model 3, the Egalitarian model is far too optimistic to be likely. Essentially, it says that if every position is as important as every other position, and which line the player is on doesn’t matter, the expansion team will get an excellent team, as it will receive a top player from all the top teams. Model 4, the superstar model is very pessimistic about an expansion team’s chances. It says that the expansion team will only be able to draft relatively inferior players from each club, and will therefore have no real hope. Models 1 and 2 seem to be promising, though in both cases the actual Las Vegas expansion team did better than what these models predicted. This elaboration of the model is meant to be somewhat more realistic, adding some random chance to the draft, as is always evident in real life. In this case, the hockey values of the various positions within the model were allowed to vary, within specified limits. These limits were 10%, 25%, 50% and 100%. 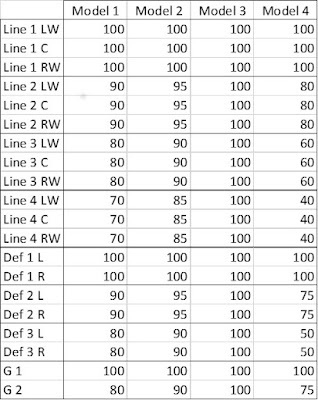 For instance, Model 1 says that a third line forward is worth 80 points to a team, compared to the 100 points that a first line forward is worth. With 25% randomization, that third line forward could actually be somewhere between 60 and 100 points, while the first line forward would be somewhere between 75 and 125 points. Basically, this says that it is hard to predict just what value a player will actually add to a team in any given year. He might be injured, and thus be less valuable than expected. Or, he might have a banner year, maturing earlier than expected, and have a great year. The key finding here is that an expansion team drafted under these rules, can sometimes come in within the top 4 places in the standings, and can quite frequently can come in between 5th and 8th (about 25% of the time). Similarly to model 1, this model finds that the expansion club has a good chance of finishing within the top 4, and is quite likely to finish within the top 8. This model strikes on as very unrealistic – it has the expansion team finishing in the top 4 most of the time. Model 4 results are interesting. Even with very high levels of randomization, the superstar model rarely allows the expansion team to finish in the playoffs, let alone in the top 5. I should note that as the randomization goes up, the range of predicted finishes grows larger. This makes sense, as the randomization is basically adding uncertainty to the models, thus allowing a greater range of predictions (larger confidence intervals). So, this simple modelling leads us to the (tentative) conclusion that the relatively high placing of Las Vegas this year can be understood, without resorting to theories of owner collusion or sports miracles. Though the Las Vegas result is somewhat unlikely, such a result is probably within the 10% to 20% range. We should think of it as being similar to getting 3 or 4 heads in a row, in a game of coin flipping - unexpected, but not all that unlikely. In my opinion, the draft rules were probably crafted to ensure that Las Vegas had a very good chance of making the playoffs, as that would be good for hockey in the U.S. southwest. However, NHL and individual team management probably erred on the side of making the expansion team’s chances a little too good. Thus, Las Vegas ends up 5th overall, and contending for the Stanley Cup. That might be because owners and league officials intuitively thought that the underlying hockey model is more star-driven than it really is. If this is the case (hockey is less superstar driven than commonly thought), there is hope for teams that can’t pay the big bucks. So, dream on, Oiler fans (and fans of similar franchises). Here's the part where I try to persuade blog readers to buy one of our Dodecahedron Books stories from Amazon. Bronco Billy has some hockey references and A Dark Horse is about gambling. Sit back and go on a ten day trucking trip in a big rig, through western North America, from Alberta to Texas, and back again. 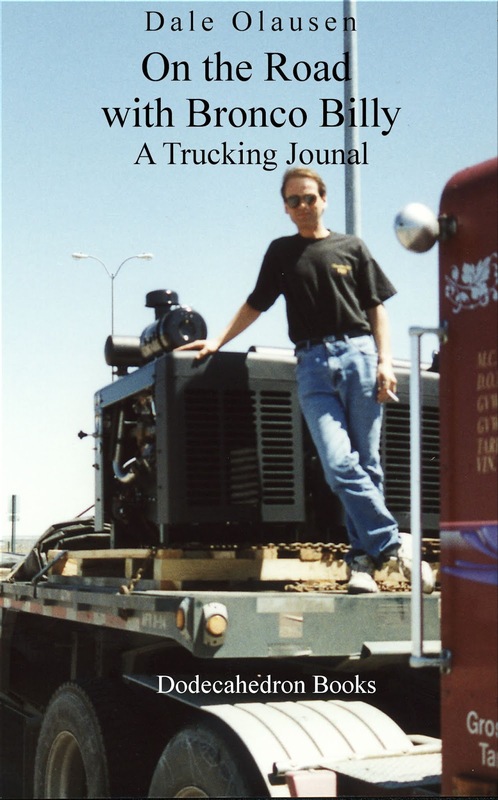 Explore the countryside, learn some trucking lingo, and observe the shifting cultural norms across this great continent. Just what might a gambler give up, to go on the winning streak of his life? Even he can't know for sure. 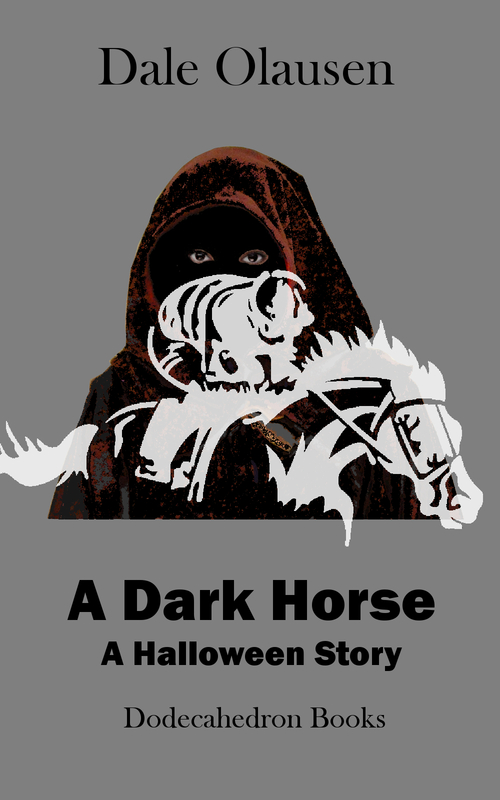 Christopher Marlowe's Doctor Faustus legend is given a Damon Runyon spin, in this short story.